With each new year comes new interior color trends, and with 2019 comes new and exciting trends you don’t want to miss out on. So, if you’re looking to switch up your home’s interior paint color this year, here are some colors you should certainly consider, as well as some colors you should probably get rid of, according to the renowned color trends of 2019. In 2019, it appears that the darker and moodier the color is, the better. So, a new “in” color of 2019 is dark green. This new favorite brings back the hunter green shades that once took over the 90s, while also adding a calming sense of nature and comfort to your home. Pair this color with natural elements, especially wood and stone textures, and other neutral tones for a fabulously stylish new interior. Looking for a softer, more earthy tone that is timeless and doesn’t clash with any of your furniture? Try a nice hazelnut tone! This neutral shade is more of a go-to color that is still trendy, yet safe. Hazelnut shades can brighten up a room, while making it feel larger and more airy, so reserve this choice for a room that needs a little bit more cheer. Muted pastels are more “in” colors of 2019 that are perfect for bathrooms, kitchens, and other common areas. These tones, whether it be a soft blue, purple, pink, or yellow, create a calming, tranquil atmosphere, which is why they are perfectly accompanied by minimalistic designs. Muted pastels are perfect for individuals who desire some pops of color within their home without having to commit to bold tones. They definitely add some color and personality to your home without being too obtrusive, and we love the atmosphere and look they create. With 2019 comes various different soft shades of blue that will dramatically enhance your home’s interior. Misty blue, ice blue, pale powder blue, and other blue tones with calming gray undertones are perfect choices to update your color scheme this year. These selections are unusual, yet subtle enough to be a quite tasteful addition to your kitchen, bathroom, or living areas. They create a soft, yet energizing atmosphere that we definitely recommend. Gray was a certainly a crowd-favorite in 2018, and it appears that this trend is carrying over into 2019. Gray is always recommended for its ability to match with anything while making a room feel open, airy, and larger. It creates a warm, calming atmosphere that is favored by all. However, to spice things up in 2019, it’s recommended to go for darker shades of gray with soft undertones of blue, purple, or green. Regardless of which shade you choose, gray seems to be a timely “in” color. Lilac may have been a strong and popular replacement for millennial pink in 2018, but this trend has unfortunately come to a close. 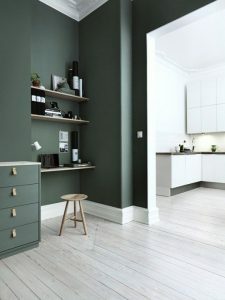 Instead of this more feminine shade, paint companies are predicting a preference towards more cool, gender neutral tones, such as the soft blues mentioned above. Mint was a popular color choice of not only 2018, but 2017 as well. However, it appears that this color selection will be replaced with the bolder and darker green shades mentioned above. If you have mint green shades within your home, consider switching to a darker hue to keep your home up-to-date. Last year was all about dark navy and black tones, and while this trend is still somewhat prevalent in 2019, the darker tones of 2019 are now a bit warmer with a grayish-brown undertone. Rather than dark navy this year, try a warmer, yet still dark tone, such as a tinted gray or sealskin color. Need a Raleigh Interior Painting Contractor to Update Your Home? Are you looking to update your home’s interior to match the latest trends? Or, do you simply desire a new look for the new year? If so, our Raleigh interior painting contractors can help! Our dedicated team at Osborne Painting has been serving Raleigh and the surrounding areas for over two decades, meaning we know what it takes to get the job done as exceptionally and quickly as possible. Our affordable and outstanding painting services will have your home looking wonderful and new in no time. Contact us today for your free estimate at 919-878-6611 or complete our online contact form.